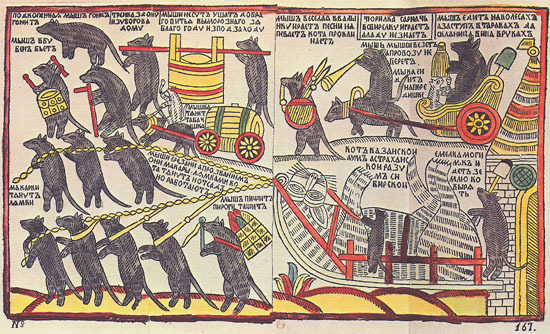 Mice celebrating funerals to the cat. 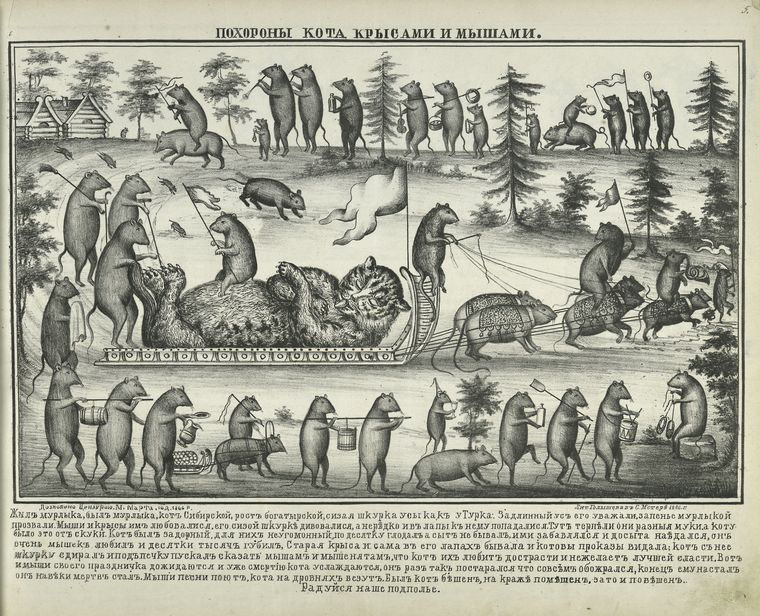 Satirical lubok on the funerals of Czar Peter the Great and on the relief of the nobility. Moscow, c. 1760. 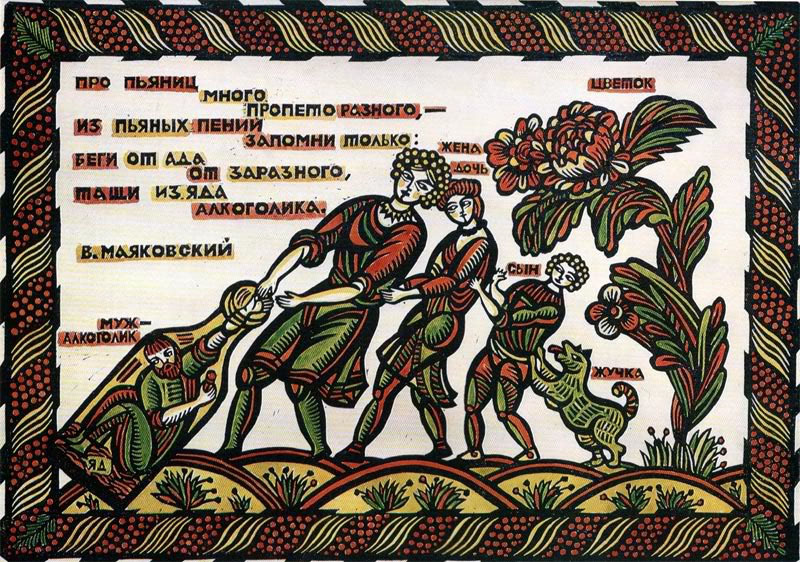 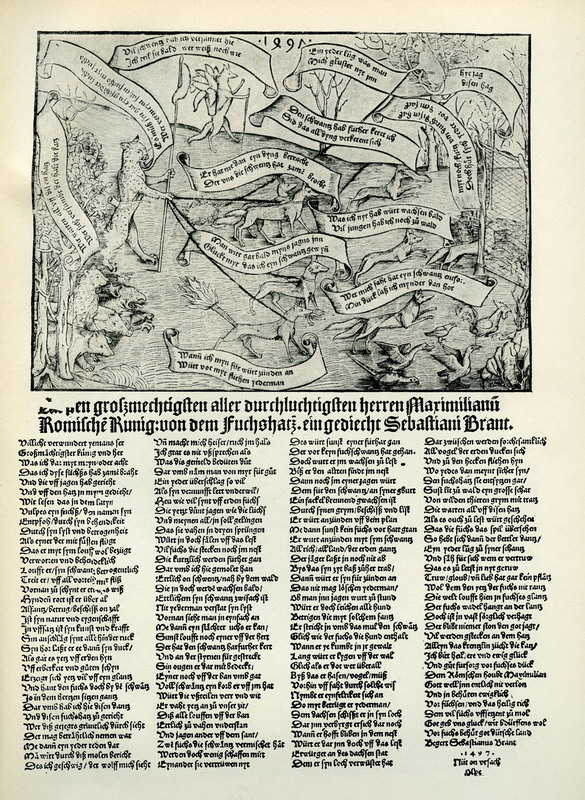 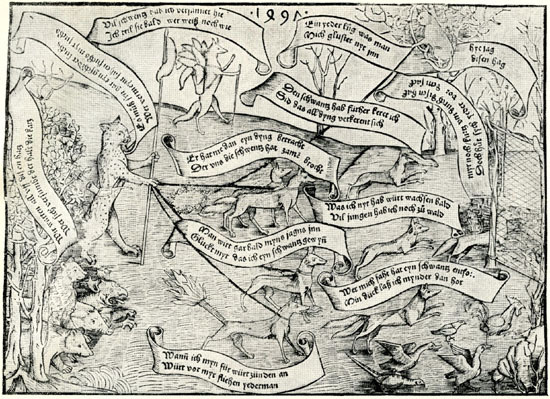 The lubok – originally meaning “birch bark” – was the Russian equivalent of the Western European Renaissance and Baroque broadside or popular print with woodcut illustrations. 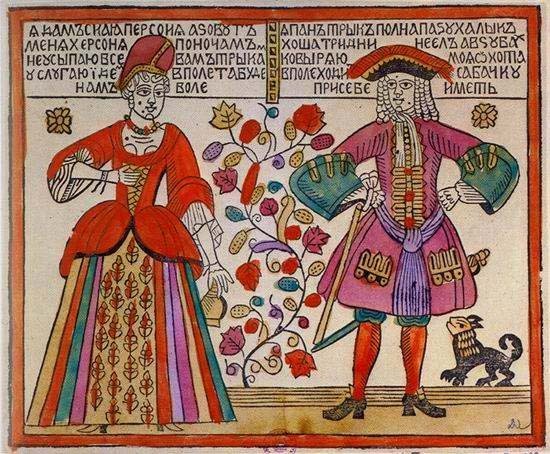 It is true that this genre arrived to Russia with a delay of some two centuries, towards the end of the 17th century. 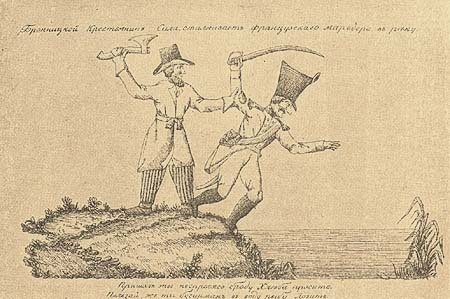 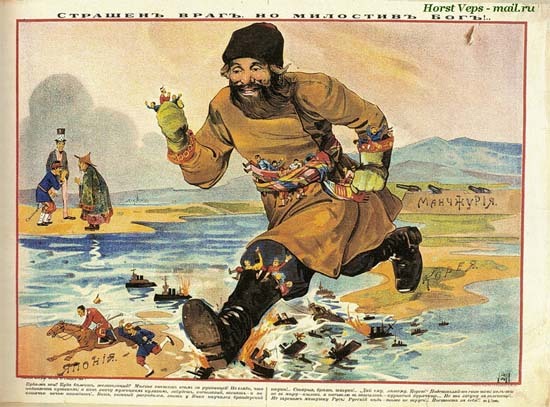 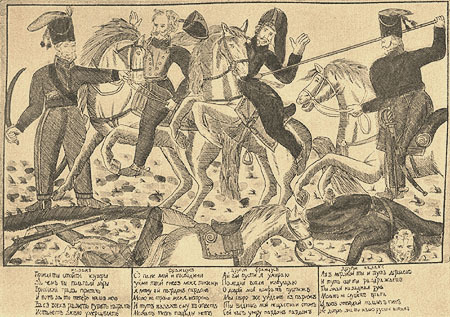 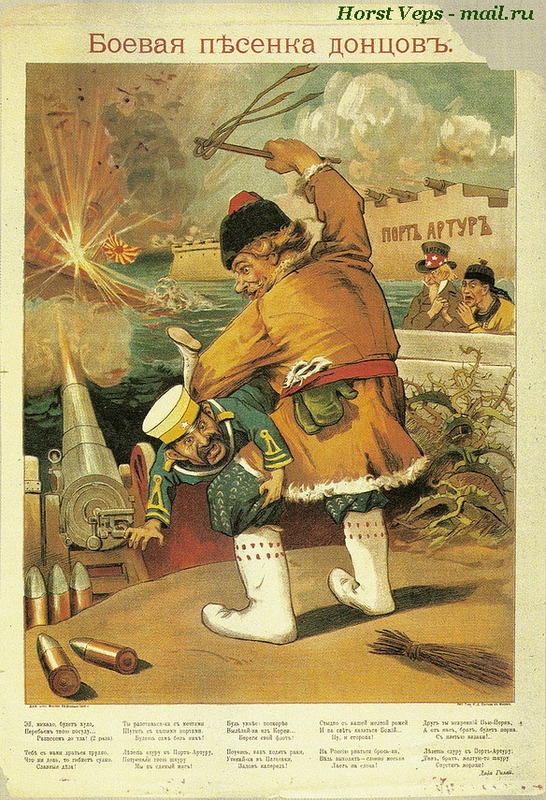 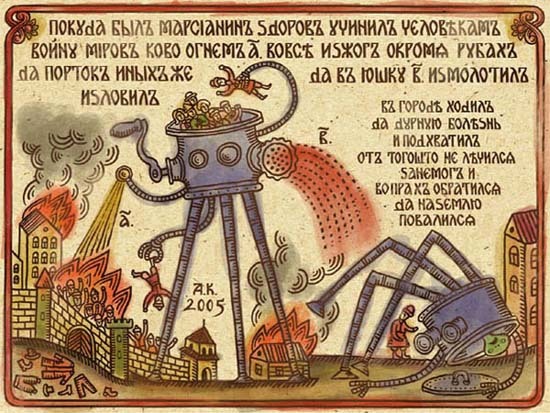 But due to this phase shift, while from the 18th century in the West the newspapers had gradually replaced the broadside and transformed their illustrations into political cartoons, in Russia the printed lubok even in the 19th and 20th centuries continued to inform large masses about the most important events like the anti-Napoleonic Patriotic War of 1812, the Russo-Japanese conflict of 1904-1905 or WWI. 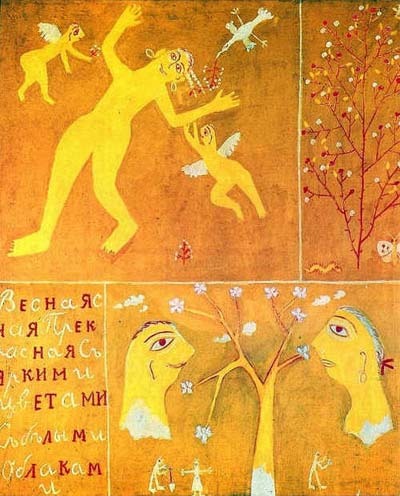 a source of inspiration for Stravinsky. 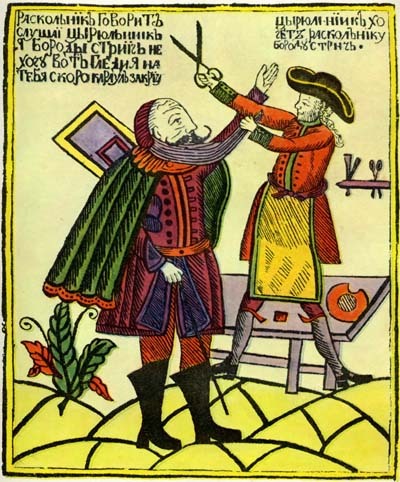 other things, made it obligatory to the nobility to shave their faces. 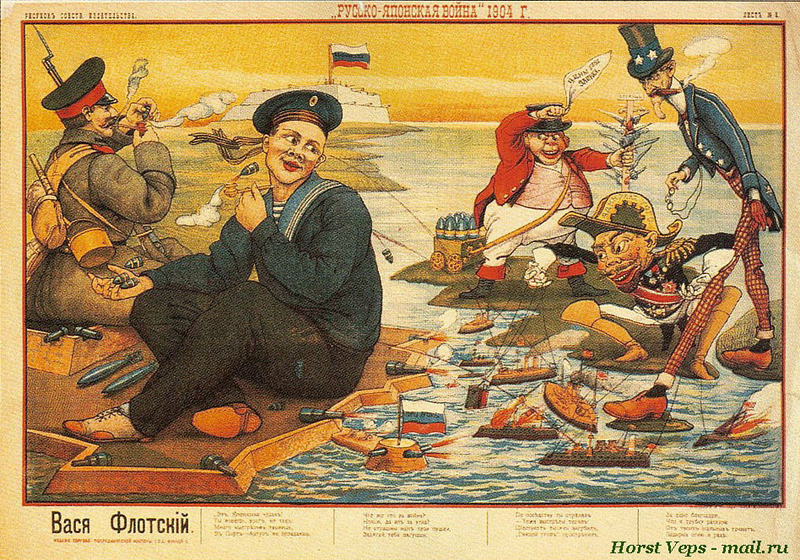 Pantyushka and Sidorka visiting Moscow. 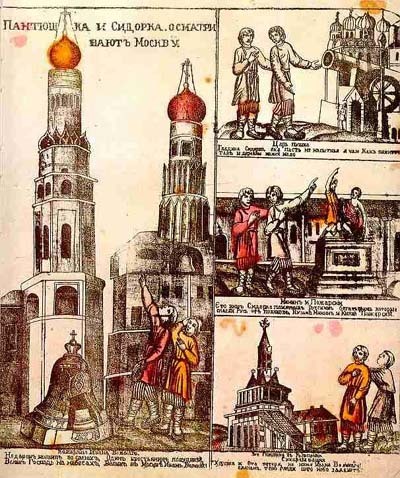 A 18th-c. lubok-guide to the sights of Moscow. 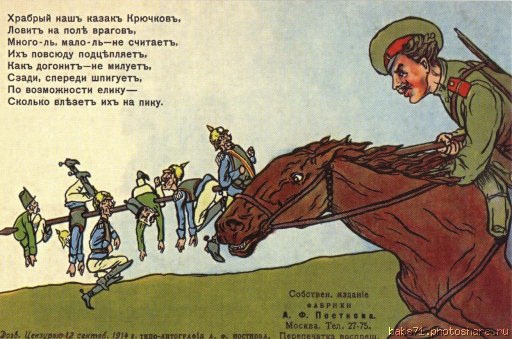 (The Patriotic War and Russian society), Moscow 1911. 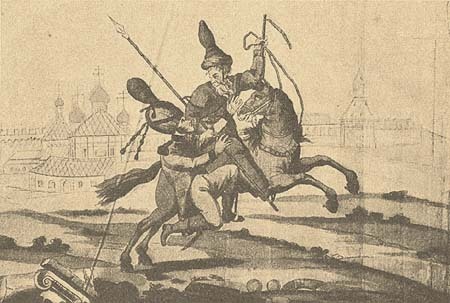 “The Cossack Play”. 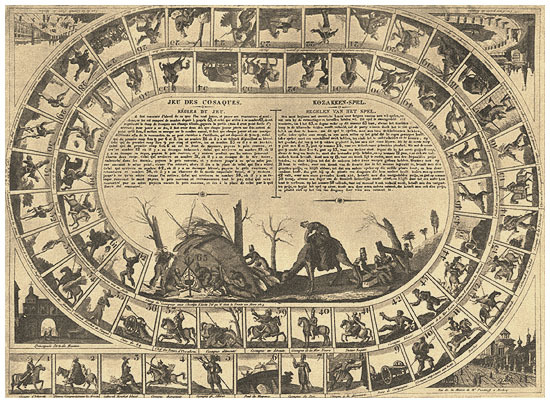 An anti-Napoleonic version of the standard 63-cells Goose Game from 1812. 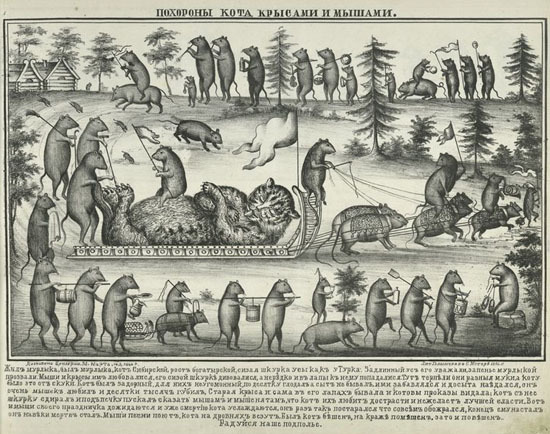 The mobilization and war popaganda also brought with itself the last great flourishing of the lubok. 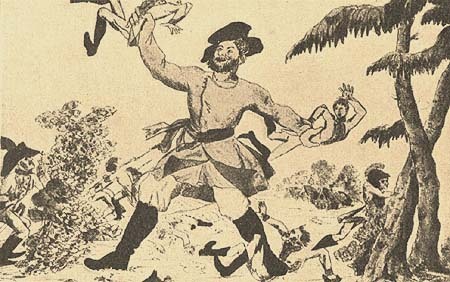 These few years yielded such an abundant crop that we will have to dedicate a separate post to it. 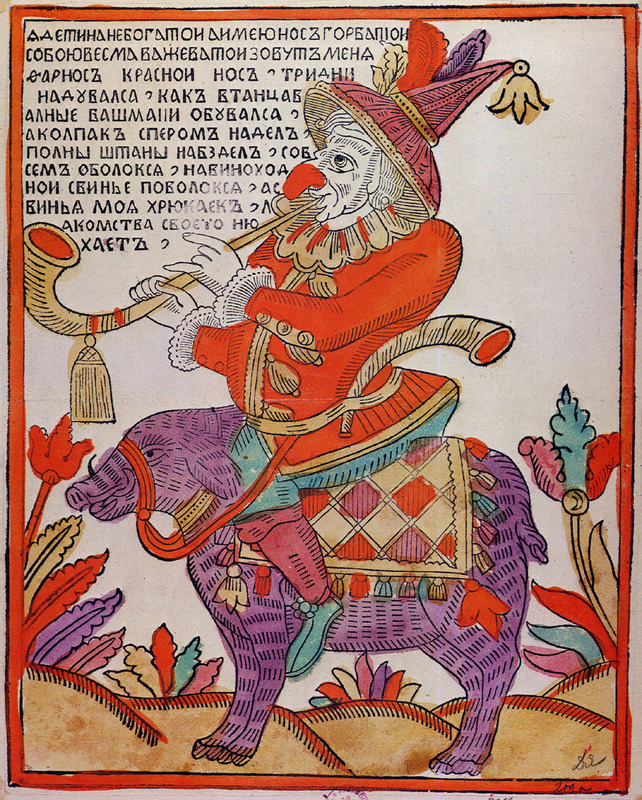 Russian avant-garde discovered lubok in the same way as their Western European contemporaries learned to appreciate old woodcuts and popular imagery. 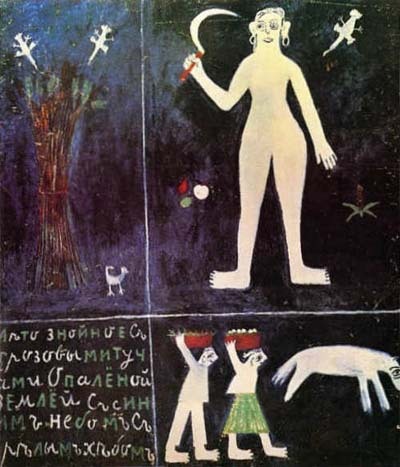 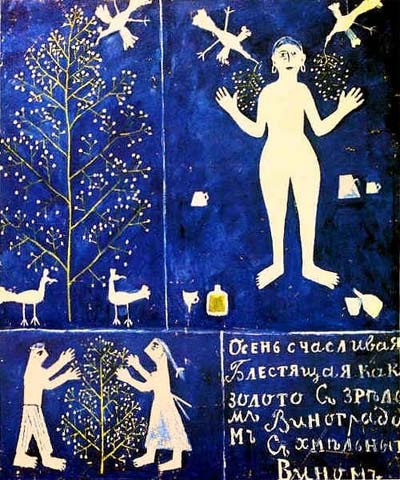 This genre provided inspiration to several works of Kazimir Malevich, Vladimir Lebedev or Mikhail Larionov, among others. 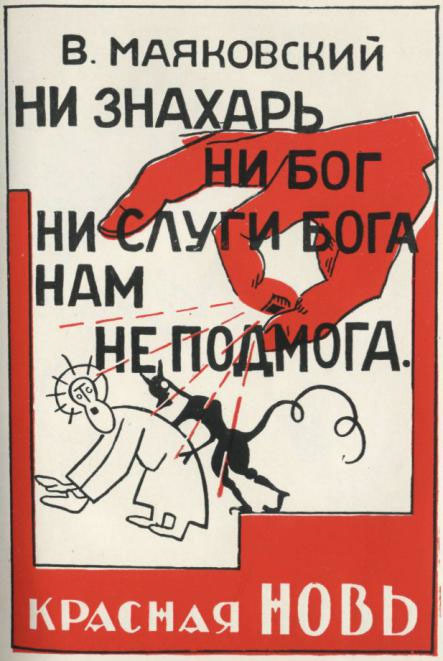 After the Bolshevik revolution the artists placing their talents at the service of the new regime transformed the lubok into “agitlubok”, an easy-to-convey media of merciless Communist agitation and propaganda. One of the leading figures of this new genre was Mayakovsky who even designed the frontispieces and illustrations of his volumes himself. 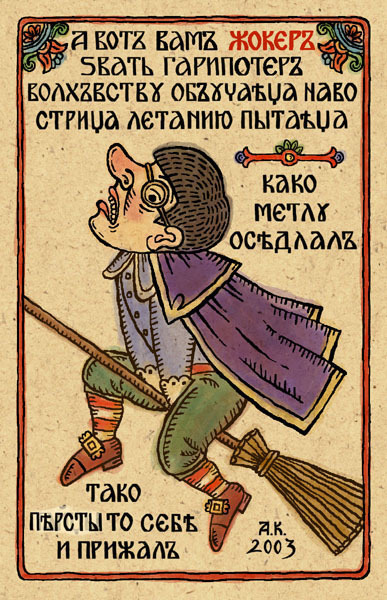 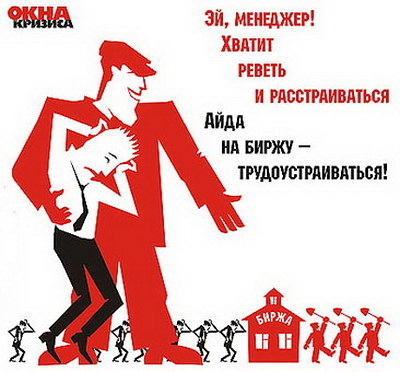 The red-black-white figures and broken verses of Mayakovsky, as we have already presented it, can be seen even today on some nostalgic agitlubok calendars. 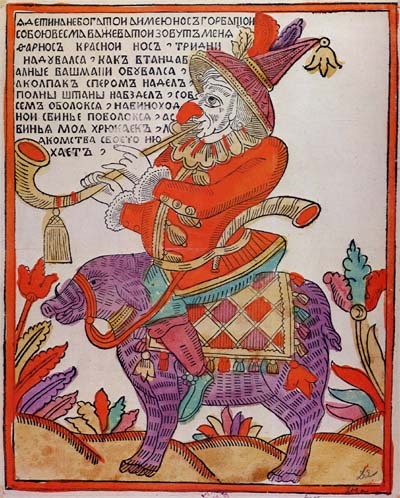 Since the 30’s, with the arrival of Socialist realism the magic realism of the lubok has been forced in the background (however suitable it would have been, for example, to the illustration of The Master and Margarita). 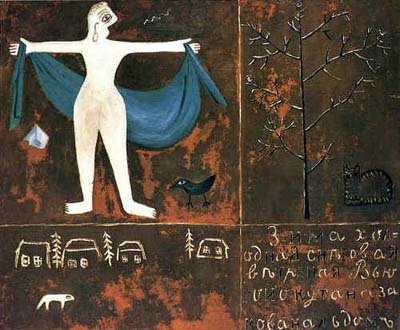 Nevertheless, it has never been completely forgotten. Luboks continued to be designed sporadically in the following decades, and in 1989 even a complete album of them was published in support of Gorbachev’s temperance campaign with the title Советский лубок. Всем миром против пьянства (Soviet lubok. 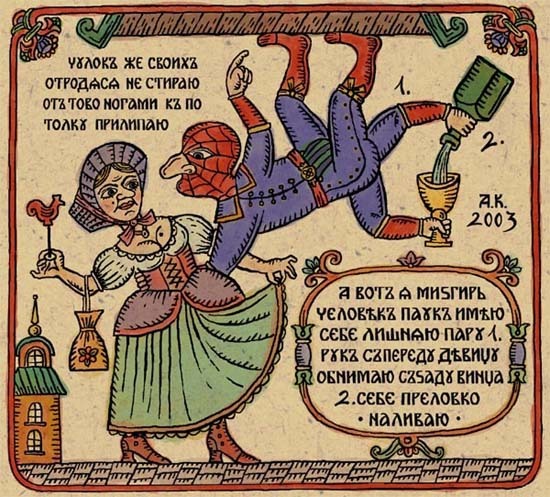 For the whole world against alcoholism). 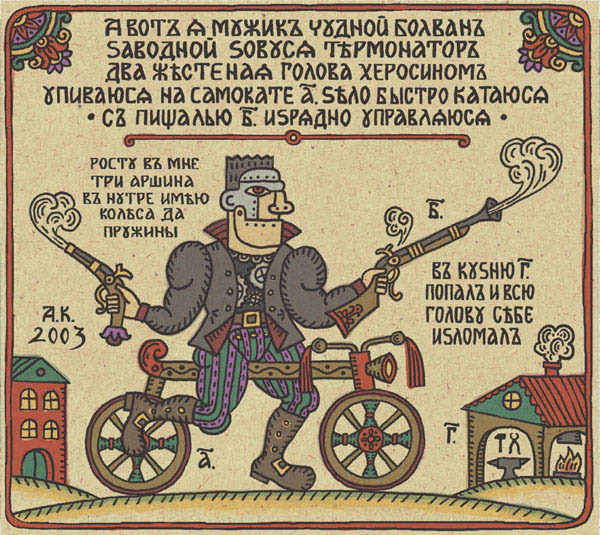 Of this fantastic document we will write more in detail in a next post. The flourishing of contemporary luboks has started in the late 90’s, and their popularity is in the ascendant. 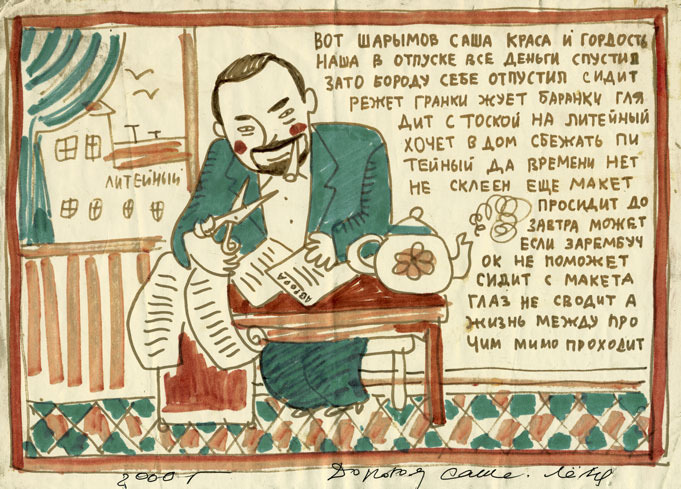 Their greatest master is the widely known and imitated Andrei Kuznetsov, whose Chukch cartoons and one lubok have already been presented in this blog. 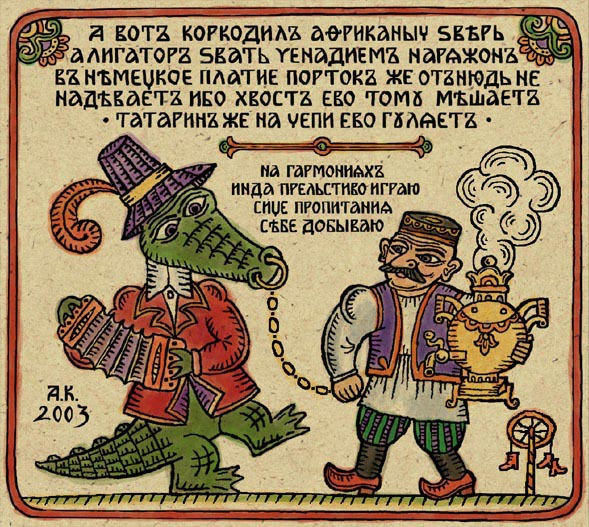 Since 2003 he has been publishing, with the title Растаманские народные сказки, that is Rastafarian Folk Tales, his modern luboks which have presented and commented on the most recent events of the great world outside of Russia – like for example the figures of the latest Hollywood films – just like their predecessors had done since the end of the 17th century. 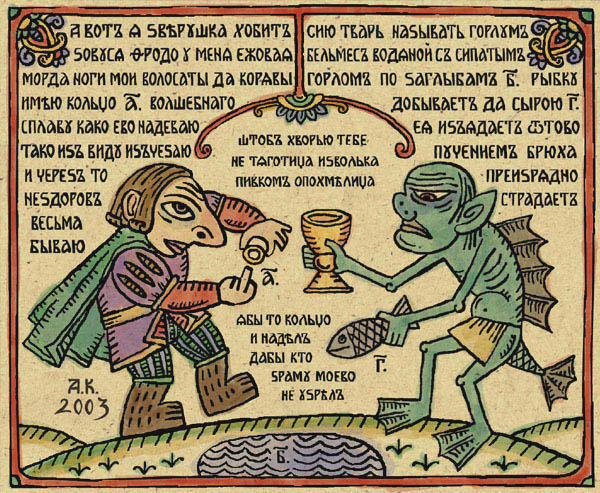 Here you can see Gorlum the vicious and Phrodo who seizes from him the Preciousss. A report on the great fiasco of the Large Swiss Collider in 2008.
spiritual cleaning of the Homeland. A patriotic Russian drunkard says no to overseas modifiers of consciousness! 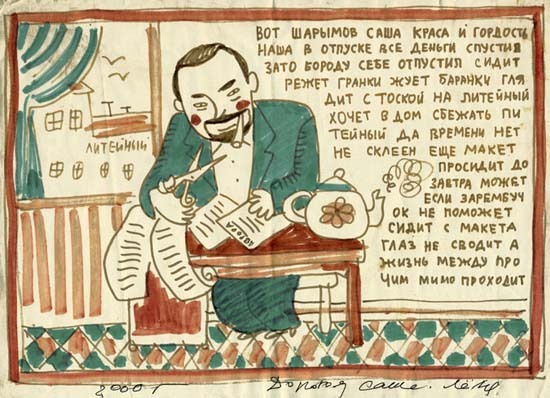 Some more luboks of Kuznetsov can be also seen here and here (at the second place with his own and his readers’ commentaries). We will also write more on them in the next post. 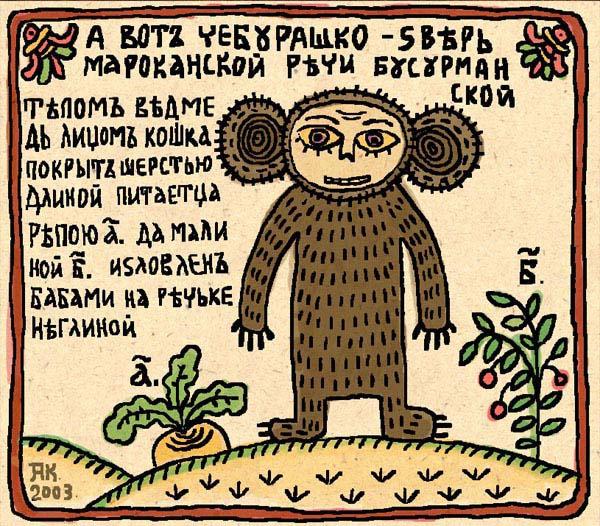 I’m really curious of it. 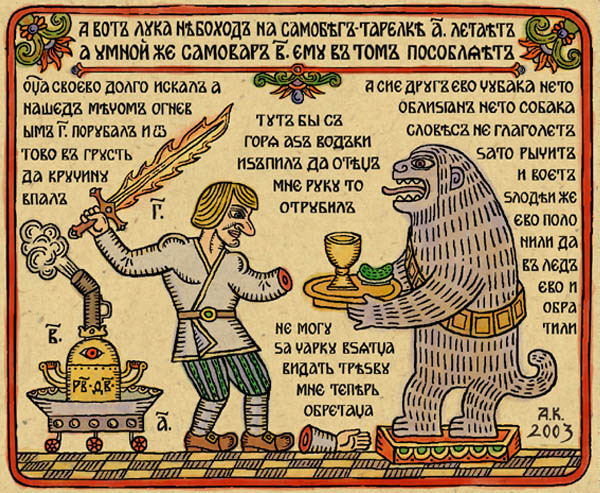 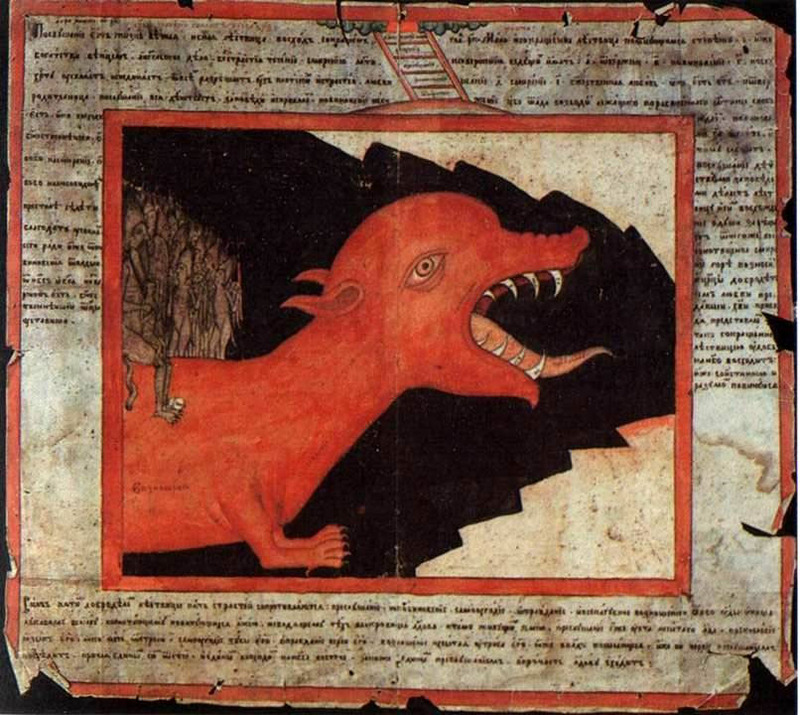 Perhaps you have discovered a far away Scandinavian offspring of Russian luboks? 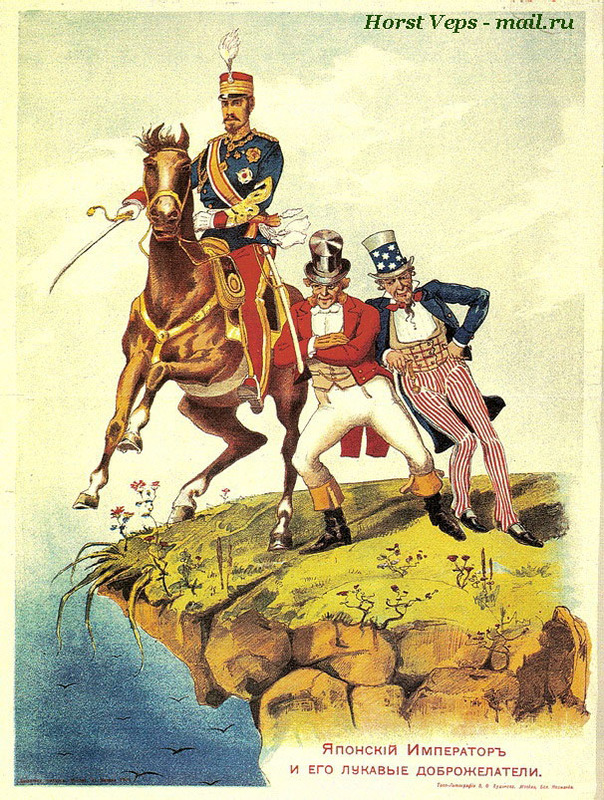 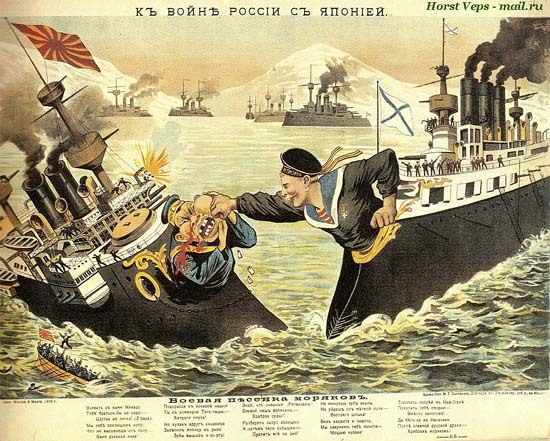 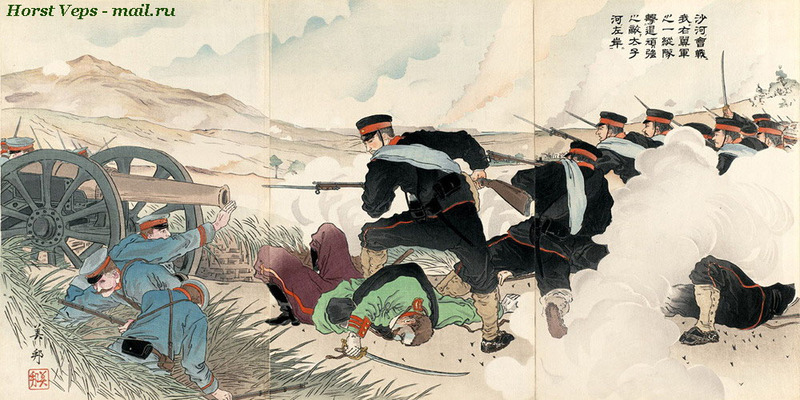 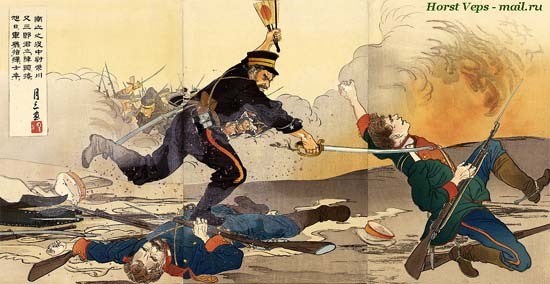 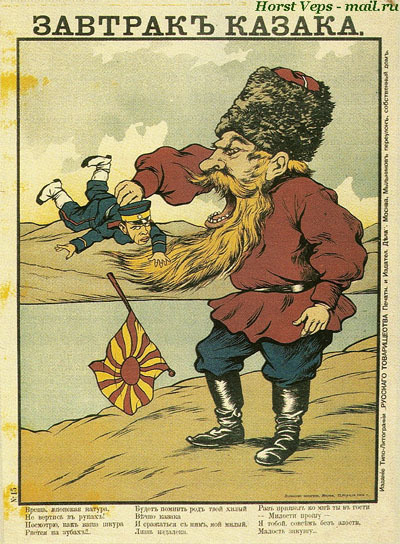 I'm writing a research project about the Russo- Japanese war in my high school, and I would like to do reference to some of the photos and cartoons you posted which regard this war. Would you be able to give me information about the source of these cartoons?